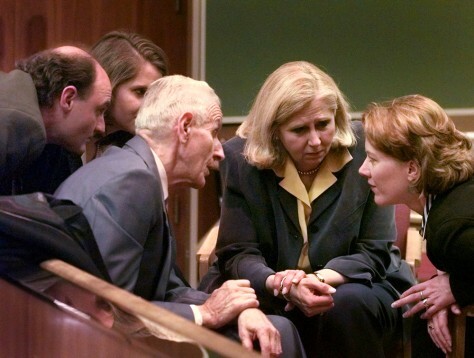 Dr. Jack Kevorkian, surrounded by Terrence Youk, far left, Ruth Holmes, left rear, and Sarah Holmes listen to attorney Lisa Dwyer, right, during the retired pathologist murder trial in Pontiac, Mich., March 26, 1999. For Youk, Dr. Jack Kevorkian's scheduled release from prison on Friday is a relief. He was grateful when Kevorkian helped his brother, Thomas Youk, end his life in 1998.